Ray Kroc- "The two most important requirements for major success are: first, being in the right place at the right time, and second, doing something about it." I believe in God, family, and McDonald’s. And in the office, that order is reversed. I don’t believe in saturation. We’re thinking and talking worldwide. When I saw it working that day in 1954, I felt like some latter-day Newton who’d just had an Idaho potato caromed off his skull. That night in my motel room I did a lot of heavy thinking about what I’d seen during the day. 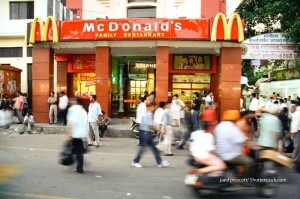 Visions of McDonald’s restaurants dotting crossroads all over the country paraded through my brain. I considered myself a connoisseur of kitchens. I prided myself on being able to tell which operations would appeal to the public and which would fail. If any of my competitors were drowning, I’d stick a hose in their mouth and turn on the water. It is ridiculous to call this an industry. This is not. This is rat eat rat, dog eat dog. I’ll kill ‘em, and I’m going to kill ‘em before they kill me. You’re talking about the American way – of survival of the fittest. I put the hamburger on the assembly line. McDonald’s is a people business, and that smile on that counter girl’s face when she takes your order is a vital part of our image. We’re not in the hamburger business. We’re in show business. I was 52 years old. I had diabetes and incipient arthritis. I had lost my gall bladder and most of my thyroid gland in earlier campaigns, but I was convinced that the best was ahead of me. The success of additions such as the Filet-o-Fish, the Big Mac, Hot Apple Pie and Egg McMuffin…each evolved from an idea of one of our operators. So the company has benefited from the ingenuity of its small businessmen. It requires a certain kind of mind to see beauty in a hamburger bun. Yet, is it any more unusual to find grace in the texture and softly curved silhouette of a bun than to reflect lovingly on the hackles of a favourite fishing fly? Or the arrangement of textures and colours in a butterfly’s wing? Not if you’re a McDonald’s man. Not if you view the bun as an essential material in the art of serving a great many meals fast. The McDonald brothers were simply not on my wavelength at all. I was obsessed with the idea of making McDonald’s the biggest and the best. They were content with what they had; they didn’t want to be bothered with more risks and more demands. Dear Walt, I feel somewhat presumptuous addressing you in this way. Yet I am sure you would not want me to address you any other way…I have very recently taken over the national franchise of the McDonald’s system. I would like to inquire if there may be an opportunity for a McDonald’s in your Disneyland Development.